Historical day celebrations in Indonesia are enlivened with various activities, ranging from social activities, education, exhibitions, official ceremonies, carnivals and many other ways. Organizing the celebration of the day of history is also celebrated starting from the community in the village, city and also government agencies in the private sector. As a historic celebration of the Indonesian nation, of course, we must be able to appreciate and respect all the services of the fighters and historians. Thanks to them Indonesia became a country that has many cultures and histories written and proved to be special. Therefore Indonesia became a country with a row of historical relics and many still stored neatly. The Indonesian Environment Day is held annually on June 5, which aims to raise global awareness of the need to take positive environmental actions for the protection of nature and the universe or the world. This anniversary is seen as an opportunity for everyone to be part of a global action in voicing protection against the planet, sustainable use of natural resources, and eco-friendly lifestyles and preserving the assets of the universe. Nutrition or nutrition is the organic need that the organism needs for the normal functioning of the body system, growth, health maintenance. In the treatment of disease, the use of nutrition as a complementary treatment can help the effectiveness of treatment and at the same time overcome the side effects of treatment. Therefore, nutrition is closely related to optimal health and improved quality of life. Therefore, every Indonesian society is recommended to have reached the value of adequate nutrition, because it can create a healthy generation, strong and smart. One historical celebration in Indonesia is a major fire event that occurred in the city of Bandung, West Java province, Indonesia on March 23, 1946. This historic event left the rest of history is very memorable by the people of Bandung in particular. At that time Bandung was destroyed by the allied soldiers with the aim to seize the city of Bandung and surrounding areas. Evidence of historical relics is located in a monument relics that were established to commemorate the event. Raden Ajeng Kartini is one of the Javanese female warriors who was born on April 21, 1879. He is famous for his idea to raise the degree of women you are called the emancipation of women. He is renowned for the tenacity and commitment of women’s education in their environment and building schools for them. In addition, Kartini’s mother is known for his writings made through the media of letters and finally recorded as memories of his writings. The Indonesian National Awakening is a period in the 20th century, in which many Indonesians began to cultivate a sense of national consciousness as “Indonesians” who dared to voice against the invaders. At that time stood also a hero called Budi Oetomo, who declared the day of history is the Day of Youth Pledge. Until now the day is celebrated as the day of history and national Indonesia. Pancasila is the basic ideology for the state of Indonesia. Pancasila is the formulation and guidance of the life of nation and state for all the people of Indonesia. Pancasila has the meaning of five precepts, which has five grains of virtue that became the foundation for the people and the government of Indonesia in obeying and living life as citizens of the state of Indonesia. Indonesian children’s day is one of the historical celebrations in Indonesia, which until now is still commemorated. Because the child is a very valuable asset and as the next generation of nation and state. Therefore, today is remembered not only among parents, but also educational institutions, institutions, and foundations of children and social activists celebrate. Indonesia’s independence day is known as a one-day proclamation day, every August 17 of every year all Indonesian citizens both in Indonesia and abroad will commemorate the day. The day is known as the day of the struggle of the Indonesian nation in dictating the entire territory of the country in order to be free from colonialism. In celebration of independence day, many performances are discharged such as carnival, art, performances and many more. The 30th anniversary of the PKI was an event that took place on the night of September 30 to early October 1, 1965, in which seven high-ranking Indonesian military officers and several others were killed in a coup attempt. In the event, there were several military officers who were tortured and his corpse inserted into a hole ie crocodile hole. It was a very heartbreaking and tragic event for the abandoned family. Until now this event is still remembered and performed ceremonies in a historic monument called the monument Pancasila magic. The Day of the Indonesian National Army is known as a historic anniversary for the military and Indonesia. The Indonesian army is a powerful and powerful army, who has the duty to defend the country and keep the Indonesian state safe from Sabang to Merauke. The Indonesian army consists of an army, air force, and navy. Where each generation has different duties and responsibilities. Soldiers have an important and special role for the nation, therefore we should as a successor should be proud because it has a full army fleet. 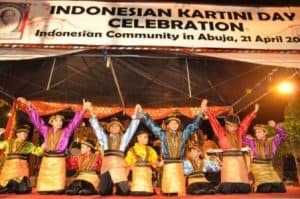 And one historical celebration in Indonesia which is celebrated with various parades and attractive military attractions. On every November 10, the Indonesian people recognize and celebrate the historic day known as the day of Indonesian heroes. Where today is remembered in the battle incident in Surabaya against the invaders in 1945. Among other historical celebrations in Indonesia, on December 10th is known as the day of human rights. Where every citizen gets equal treatment and protection. Human right is an institution that highlights the rights of everyone and helps in the event of deviation against it. Every December 19 Indonesia celebrates the historic day of defending the country. State defending is a day where every citizen has an obligation to defend the homeland and nation in peace and resilience of Indonesia. Therefore today is a day of history and a day where the whole society honors the heroes and warriors of the nation from ancient times until today. So the discussion and some collection of the 13 historical celebrations in Indonesia that you can remember and remember always. See you again in time.